Expert Rehan Jalali is known as the supplement mad-scientist. 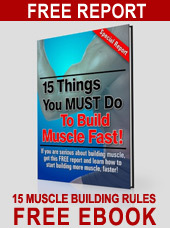 He has been the brains behind many successful bodybuilding supplement creations. In addition to his extreme knowledge in the supplement arena, Rehan is also an intense weight training expert. 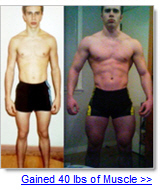 In this report, he will outline his "BodyShock" system that enabled him to gain 20 lbs of muscle in 12 weeks. The system contains your complete workouts and diets for the entire 12 month program. Using the latest advancements in training, diet and supplementation, he achieved his goal of 20 pounds of lean muscle in three months. As a sports nutritionist, he had to practice what he preached. To do something extraordinary, you need to take extreme measures. You have to force your body to grow, especially if you're a hardgainer. The BodyShock system he developed can help you start making gains again fast and produce mind-blowing results that will have your whole gym talking.